This guy is an excellent photographer. His portfolio is very interesting! A friend sent me the link, along with one of the Kom pics. That's to Foo Foo for me. I'll take an old bugger laying in warm compost. Last edited by DoubleDogFarm on Sat Apr 09, 2011 5:18 pm, edited 1 time in total. I made my way through the whole 36-view slideshow. *whew* some of those are...weird. And the eyes of the Malamute, followed by the running for the sake of running Mals, are wonderful shots. Yeah, I'm not much into the close-up of the nose or the "wrinkle" studies. I've washed too many wrinkly dogs who had unimaginable crud in those wrinkles that no amount of shampoo, fingers, or Q-tips could get out and which smelled to high heaven. "Oh, that's just how [Fido] smells," said the owner. "We suggest that you consider seeing your vet; [Fido] may have a skin condition, since we were unable to get the wrinkles as clean as we would have liked to without hurting the dog," was our standard reply to these dimwits. And as for Afghan Hounds...the most accurate thing I've ever heard about them in urban society is that they get lost at the end of their leash. One of the least intellectually gifted breeds of dog out there, and I've known two of them up close and personal. Yep, dumb as rocks, those two. My pick is the old bugger on compost. We've had black labs for37 years and we love them! From their water love to being driven by their stomachs to their gentle, goofy temperment and being a pup at heart forever. So the second time, I watched it all the way through. I only made it to about slide 10 the first time. It's actually pretty good. The malamute is a handsome breed. I'll stick to the large breeds. DoubleDogFarm wrote: I'll stick to the large breeds. --"doggie wannabe" / "wannabe dog"
--"one of the ugliest cats I've ever seen"
Note that Corgis, Keeshonden, and other smallish breeds are true DOGS by this standard, but the Toys, small Terriers, and the pink blotchy thing in the slide show are all doglets, together with others of their ilk. I mean: I have cats already! The "8- to 18-lb mammalian quadruped, carnivorous creature" eco niche in my household is occupied by creatures elegantly evolved for said niche over millions of years by the best in the biz: Mother Nature herself. I don't need some Doggie Come Lately, developed in the last century as a "Lady's Companion" or paperweight or whatever, to confuse the issue *and* not do a thing about mice *and* not purr. The first Kees I knew had been raised with a dominant cat. The Kees and I, on a road trip, ended up sleeping in the same bedroll. I'll be dipped if he didn't--yes!--try to purr as we were falling asleep. That's what it sounded like to me, at least, and his person agreed: Doggie did try to "purr" occasionally. But most of them (dogs, esp. microscopic ones) don't. I need functional animals who can help me, at least by *looking* large and menacing to persons of ill will. And a BIG BARK helps. A lot. Well, of course, I loved all of the Kom pics. And I loved the nose close-up, as well, because it reminded me of my old Newfie's nose. (My son called him "Nostrildamus". ) I also got a kick out of the Yorkshire terrier in show wraps. I used to have to wrap my first Kom's muzzle cords, so they didn't get in her food or water after I had groomed her for a show. I just thought the pics were interesting. I like all dogs. But then, I pretty much like all animals. Last edited by Kisal on Sun Nov 07, 2010 5:07 pm, edited 1 time in total. I'll side with Cynthia on this issue. I'm hard pressed to understand small dogs. Most I've been around are bundles of nervous energy that bark incessantly and pee on you if you pick them up. I have 2 sister-in-laws that have small dogs, one that looks like a walking dust mop, the other, one of those hairless "Ugly Dog Contest" frequent winners. You know the ones that have the sprigs of hair on about 3 body parts, and not the right ones if you ask me and they live with their tongues sticking out like it's 5 sizes too big for their mouths. Useless animals!!! I tend to like the larger breeds. From my 20's to my mid 40's I raised Pit Bulls and those were some of the finest dogs I've ever had. I also had Dobes and once had a Rottweiller that was a dog with a great disposition but horrible hips. When I married my wife, she came with 2 kids, a cat and a dog. Her dog was a Cocker Spaniel and to tell the truth, I didn't like it much. Out of all the Pits I had over the years, not one ever bit anyone, but that Cocker would bite folks at least once a year, especially kids. It got to the point I told my wife I'd put him down if he did so again. Fortunately for him, he got old, lame and calmed down a lot. He was eventually put down at age 16 due to health issues. At age 58, I no longer own a dog but my wife got another cat 2 yrs. ago and I'm getting use to it Got to admit, they are much easier than dogs to keep, just not near as giving of themselves----------only when it suits them------kinda like teenagers. I'm a big dog fan too. I rescued a deer dog [mutt but huge] after some jacka$$ hunter had abandoned him. He didn't like fences. I put him in the back yard and I'd come home to find him curled up on the front porch. He would literally knock down the fence. I repaired the fence and left him on the front porch. I came home and found him on the back porch. Fence was down again. I left it down. My black lab would dig 4 holes in the shape of a square that looked like a baseball diamond. She would "run bases" for hours. As she hit each hole, she would brake with her front paws slinging dirt in the air. Then she would snap at the flying dirt, bark a time or two and then "steal" the next base. I always figured she was Shoeless Joe Jackson reincarnated. Now here is the point. My wife brought home a miniature Schnauzer about a year after we were married. I told her there was no way I would have anything to do with that useless little rat. Within two weeks, I was dressing her in her little sweaters. Never say never. Double Dog, pictures two and three but particularly three say all that anyone need know about dogs. We currently have a German Wirehair, Brittany Spaniel and, "hanging my head in shame", a Yorkie-Poo. We always had dogs of the larger variety - Border Collies, Labs, Dobermans- but DD suffered a head injury when she was 10. She was released from the hospital a week before her 10th birthday and wasn't allowed to do much of anything for quite some time. Even though we had 4 large dogs (2 Border Collies and 2 Labs) at the time the only thing she asked for was a little fro-fro dog. Needless to say I found her 2 lbs of black fluff and we gave her Shadow. The puppy immediately knew his job was to sit with her and be her little companion. He did win all our hearts in the end and he maxed out at 10 lbs. Since he's always been the small dog in a big dog house, he has a bit of a Napoleon complex. Anyway, my point was dogs of all sizes have their place. Sometimes it's just a matter of circumstance and timing. is that the best way to 'grow' new ones.. in warm compost? Yes, I believe so. If you look at the second and third photo, you can see he's being rained on. Best propagation. Keep the surface moist and a source of bottom heat. This picture, you can see the steam coming off the compost. Look mostly to the right of Jacob. Jacob was looking ghostly, with the water droplets on his coat. Did show up in the picture. Last edited by DoubleDogFarm on Sat Apr 09, 2011 5:20 pm, edited 1 time in total. And boo to all you big dog ppl. Although I will freely admit that I was once one of you. Little dogs don't have to be be yappy, anlkle-biting, peeing monsters. 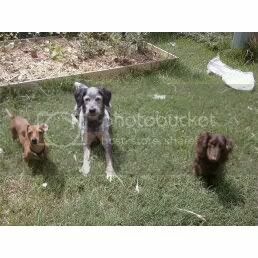 I have 2 mini-dachshunds along with my heeler mix. I've always hated little dogs, never saw the use for them. Those 2 little weiners keep up with me and Cerbie. They go on 5 mile hikes with us, they run at the dogpark, they go swimming in the pond at my aunts's country house. They also raise the alarm. My big dog thinks everybody is his best friend, and would gladly lick an intruder to death. Unless the little ones bark, then he's on alert. I'll add, my 2 smaller dogs don't yap, they don't pee if they're excited (my boy will occasionally pee if he's scared, but he was abused for 6 years, so he has a pass on that one, and it's gotten so much better), they let people handle them, they both love children, and they aren't neurotic messes. I still want a mastiff. lol. My boy Max killed a water mocassin that was creeping up behind me. That was the day he became our dog, no longer a foster. They also help me garden. I think we know that ALL dogs are pretty awesome, regardless of size. Mine was a medium-sized Shih tzu x Husky - may he be stirring up trouble in the Big Garden in the Sky! His mum was the Husky, so imagine what his dad had to do!! That's hysterical, Troppo. I bet that was an odd looking dog. I love wierd mixes like that.